Midwest farmers now have a resource nearby to provide soil biology assessments quickly and accurately. 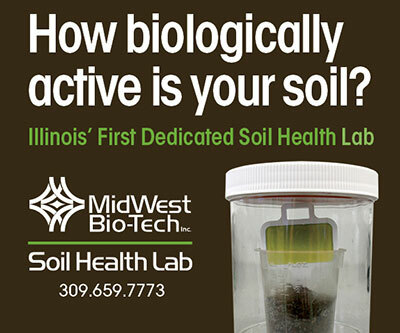 Midwest Bio-Tech recently opened Illinois’ first dedicated soil health lab. The Midwest Bio-Tech Soil Health Lab offers tests for carbon dioxide respiration, amino-nitrogen, and soil aggregate stability. These tests and more can be performed quickly so that the results can be returned in just a few days. The Soil Health Lab is an approved partner lab for Woods End Laboratories, originators of the Solvita test for soil respiration. The recommended frequency of soil health testing depends on the farmer and their operation. Miller explains that some farmers test more frequently than others, especially if they're making production adjustments such as changing tillage or incorporating cover crops Also, the number of samples to collect from each field depends on the number of distinct soil types and management zones in the field. Tests available from the Midwest Bio-Tech Soil Health Lab include the Solvita CO2 Burst Test, Solvita Labile Amino Nitrogen (SLAN) test, Volumetric Aggregate Stability Test (VAST), soil pH, bulk density, soil organic matter, electrical conductivity and more. For more information on the Midwest Bio-Tech Soil Health Lab, call 309-659-7773, e-mail info@midwestbioman.com or visit https://www.midwestbioman.com/soil-health-lab/. For nearly 40 years, Midwest Bio-Tech has been helping farmers boost their bottom lines biologically. The company offers biological products like Chandler Soil, Biocat 1000, Foliar, Dry Seed Treat, and Organic to build healthier plants that make more efficient use of nutrients to generate higher grain and forage yields. For more information on Midwest Bio-Tech, visit www.midwestbioman.com.